← 253 "Homer vs. Dignity"
Santa's Little Helper dances on his hind legs. The family walks in and he slowly stops dancing, sits back and barks. "I will only provide a urine sample when asked"
"The Computer Wore Menace Shoes" is the two hundred and fifty-fourth episode of The Simpsons and the sixth episode of the twelfth season. 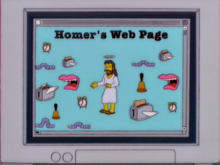 "Homer buys a computer and builds a web site where he anonymously spreads local rumor and innuendo, and makes things up when his sources run dry. When one of these fake stories turns out to be true, Homer is kidnapped and transported to "The Island", a place where those who know too much are taken out of society." Homer is the only one to show up to work. Everybody else received an e-mail letting them know the nuclear plant was closed for the day, but as Homer tells Lenny and Carl, he has never owned a computer. Feeling left behind in the technological dust, Homer decides to purchase a computer, and ends up buying the most expensive one in the store thanks to a slick salesman. He brings it home, but quickly throws it in the trash when it is unable to assassinate Ned Flanders. Eventually Lisa helps Homer become computer literate, and in the following days Homer creates a website... filled only with spam and internet memes borrowed from other sites. He is upset nobody has visited his site, so Lisa suggests that he should offer something society needs or wants. After Bart dishes some gossip he heard about the pothole repair money being used for Quimby's swimming pool, Homer decides to create a "news" website, calling himself "Mr. X" so that anonymity could protect him from any angry citizens he may write about. Subsequently, Mayor Quimby is exposed and the pothole repair funds are returned. "Mr. X" (Homer) is heralded as a hero. The townspeople want to reward him, but since they don't know who he is, they say they'll give their money to the needy. 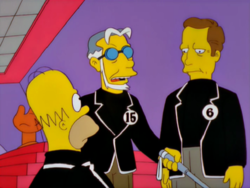 Not being a charitable person, Homer quickly unveils his identity, winning the Pullitzer Prize ("Finally", he groans). Soon enough, people become more tight lipped around Homer; once he runs out of real news, he begins making up wild stories and accusations. One of his wild stories states that flu-shots are given only as a form of mind control (it's why there's a big shopping rush just before Christmas), Unbeknownst to Homer, this turns out to be true. A group of people kidnap Homer and keep him on an island as part of a massive cover-up, so nobody finds out about the flu-shots. Other people on the island are being held for other strange secrets or inventions they have discovered, such as turning water into gas or a peanut bag with no bottom. Meanwhile, Homer is replaced with a man who looks identical to him, except he needs to shave his head and speaks in a German accent. Homer escapes the island on a crudely made boat he stole from one of the island captives, in the process getting past an anti-escape orb by popping it. Once home, Homer defeats his clone and re-unites with his family. However, they are then drugged by Santa's Little Helper, and are all taken back to the island. The episode was written by John Swartzwelder and directed by Mark Kirkland. Patrick McGoohan guest stars. "The Computer Wore Menace Shoes" received positive reviews from critics who praised The Prisoner references. Den of Geek said the episode is a fan favorite. The episode got a 3.72 out of 5 ranking 227 out of 373 episodes on The Simpson Crazy Site. DVD Movie Guide gave the episode a positive review saying "With its spoof of Internet idiocy, “Shoes” scores points. DVD Verdict said the greatest moments of the episode are The Prisoner spoofs. The episode received two reviews from About.com, giving it a 3/5 and a 4/5. Modified on July 9, 2017, at 08:45.